NZLA AGM week-end hosted by Fernhill Llamas and friends. We met on Friday night for a welcome meal and catch up by the fire. On Saturday some of us went to Lyttelton Market to get bread for lunches and visit Robyn’s new house which is in the process of renovation. After lunch at Fernhill we went for a walk across the Reserve to see Robyn’s cria at Llama Lookout and say hello to Fernhill llamas on the way. Keith updated us on the issues re TB testing and the Alpaca Association. We had a very full discussion over afternoon tea before beginning the AGM at 5.00pm. On Sunday Amy and Jenny joined us for a Craft Day and four visitors also attended. 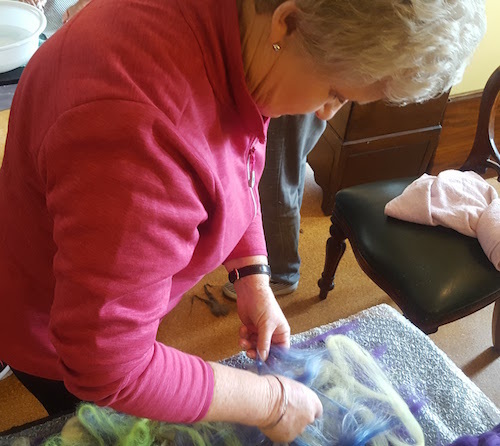 Jacky facilitated a wonderful day where everyone was able to create an item from llama fibre.